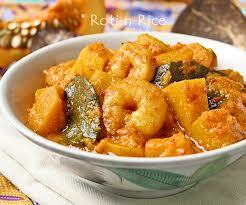 Pumpkin Happy Halloween Shrimp Curry! Heat olive oil in a large saucepan over medium heat. Add onion and ginger; sauté until soft, about 8 minutes. Add garlic; cook for 1 minute. Stir in plum tomato and pumpkin purée; cook, stirring frequently, until pumpkin is golden brown, about 10 minutes. Add vegetable broth, coconut milk, curry powder, and cayenne pepper; simmer for 20 minutes. Add butternut squash, shrimp, and lime juice. Simmer until shrimp are cooked and squash is warm. Serve with steamed rice if desired. Top with cilantro, lime zest, and fried shallots.